Is the U.S. Consumer Spending Surge a 'Dance of Economic Death'? The economists interviewed by the A.P. put a spin on this story to the effect that Americans are spending more because they're earning next to nothing in interest on savings in the bank. For instance, the annual yield on six-month certificates of deposit is currently 0.23 percent, according to Bankrate.com. Five years ago it was 3.62 percent. As the A.P. article stated, "If you put your money in the six-month CD today, you'd make about enough to buy a burger." It's a conundrum that has perplexed economists and is difficult to explain. Have consumers essentially embraced an "eat, drink, for tomorrow we die!" attitude toward spending in a sluggish economy - a dance of death if you will? Has discretionary spending supplanted the need for saving among a jaded populace worn out by four years of recession? Or have consumers simply been forced to spend a greater part of their incomes on rising fuel and food costs? The answer is a combination of each of these rationales for spending, as we'll discuss here. There are three basic components behind the increased consumer spending in a stagnant economy. The first is psychological. Despite the low consumer confidence ratings of recent months (see chart below), consumers are spending more this year on discretionary items as well as on necessities. One reason for this is the "echo effect" of the financial market rebound of the last couple of years. Studies have shown that investors and consumers tend to be 2-3 years behind the curve of a financial market trend. That is, investors who were scared onto the sidelines by a stock market crash will usually wait up to two or three years before re-entering the market, but only if stocks have advanced during that time. Consumers were shell shocked into curtailing their spending by the recession and credit crash of 2008-2009, but have slowly emerged from hiding in the past year, particularly in the upper income brackets. Spending on luxury goods - from cars to furniture to designer clothing - has risen dramatically in the last year alone. Meanwhile, even the beleaguered middle class consumer has gone from being a big saver (after the credit crash) to a heavy spender. This transformation can also be at least partly attributed to the stimulus-fueled market rally of the last two-and-a-half years. The middle class is tired of seeing the upper classes driving around in BMWs and Mercedes while they scrimp and save to no avail as retail prices continue to rise. So they have finally capitulated to the ingrained (some would say American) urge to shop and spend. A recent book by Lee Eisenberg answers to this primal urge, viz. "Shoptimism: Why the American Consumer Will Keep on Buying No Matter What." The second reason for the increased spending patterns of consumers is a simple personal finance issue. As the A.P. article quoted above suggests, consumers are reacting to the ultra-low interest rates of the last two years with a "silent revolt." Instead of verbally protesting, they are protesting with their wallets. Rather than watch the value of their savings erode by the Fed's loose money policy, many of them have decided to purchase hard assets and other goods that at least have a practical use and can serve as a substitute for financial market investing. Perversely, consumers' decision to spend rather than save play right into the hands of the Fed by giving it exactly what it wanted in the first place, namely increased consumer spending to keep the domestic economy rolling. This is just one of the many tricks Bernanke has up his sleeve to keep the economy relatively stable for as long as possible as the Fed tries to figure out how best to combat the deflationary long-term trend created by the 60-year down cycle. A third reason for the surge in consumer spending can be ascribed to the residual momentum generated by the recently peaked 6-year cycle. A similar phenomenon was witnessed back in late 2009 when the 10-year cycle peaked, and again in 1999 when the 30-year cycle peaked (all of these cycles are components of the aforementioned 60-year cycle). In the 2009 and 1999 cases, the yearly cycle peaks were followed by an additional surge of spending for at least a few months resulting from the momentum created by the upward phase of these cycles. Simply put, a cycle generates its own momentum and, depending on how close it is to peaking or bottoming, this momentum tends to carry over beyond the mid-point of the cycle until the momentum either dissipates on its own or until it is reversed by an outside force. 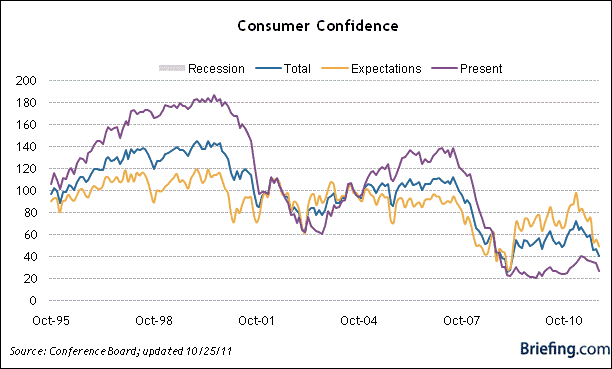 The consumer confidence chart shown above is typical of most economic indicators in that it is a poor overall reflection of what economic actors (i.e. consumers) are really doing right now. A better indicator of what consumers are doing now, and what they'll likely continue doing in the foreseeable short-term future, is found in the New Economy Index (NEI). I've updated this indicator for the benefit of readers for the last couple of years, though plenty of skepticism has been expressed over the validity of this indicator. Yet in spite of the simplicity (some would say overly simplistic) nature of this indicator, it has consistently tracked and/or predicted the main direction of U.S. retail spending patterns since before the credit crisis began. Below is a recent update of the NEI chart. 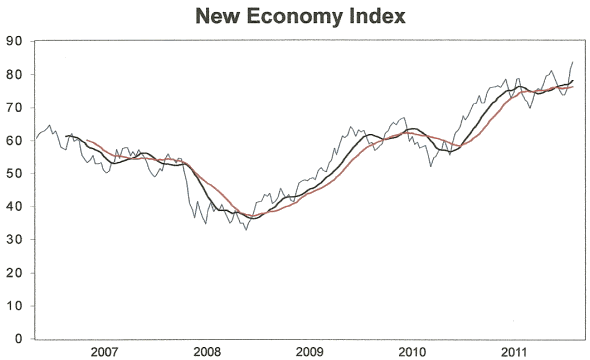 The interpretation of this chart is straightforward: when the indicator itself is in a rising trend above its 12-week (black line) and 20-week (red line) moving averages, the U.S. retail spending economy for consumers and businesses is considered to be improving (or at least holding steady). If the two moving averages are in a confirmed decline, then the short-term retail economic outlook is bearish. To date this indicator has reflected a buoyant economic outlook in terms of retail spending as we head into the critical Christmas shopping season. Thus, the economy will probably be able to end the year on a relatively positive note in spite of the fact that the middle class is still in a wage and balance sheet recession and the jobless rate is still high. At the end of the day, Fed Chairman Bernanke's easy money policy of the last couple of years is doing exactly what it was intended for. As Eric Green, chief U.S. economist at TD Securities observed, the Fed's policies are "designed to reward spending and effectively punish savers." The latest data suggests it is doing just that. After building support above the dominant longer-term 30-week (150-day) moving average for four weeks, the gold price confirmed a breakout signal last week on news that an agreement which addresses the euro zone debt crisis by Europe's financial ministers was close to being finalized. 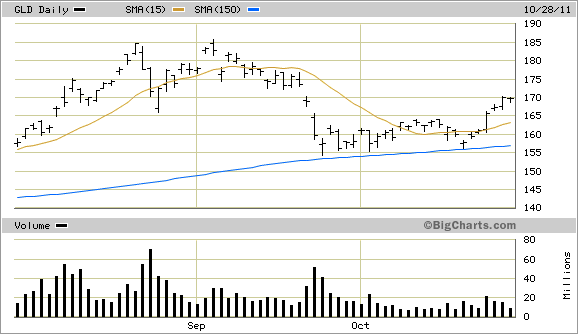 The SPDR Gold Trust ETF (GLD), our gold proxy, up until last week had been overshadowed by the recent margin requirement increases in gold but this point was made moot by Tuesday's (Oct. 25) 2.84% upside move on increasing volume. The intensity of last week's breakout suggests it was more than just short covering or reactionary buying due to the news coming out of Europe. It also suggests that this could be the start of an interim recovery for gold. Ironically, gold stands to benefit from both the uncertainty surrounding the European sovereign debt situation as well as any jubilation resulting from makeshift plans for dealing with the debt (as this entails dollar weakness).